A fruit crumble is a comfortable and straight up pudding. Its simplicity is its magic. Apple Crumble is the classic, but you can use any fruit for a crumble. 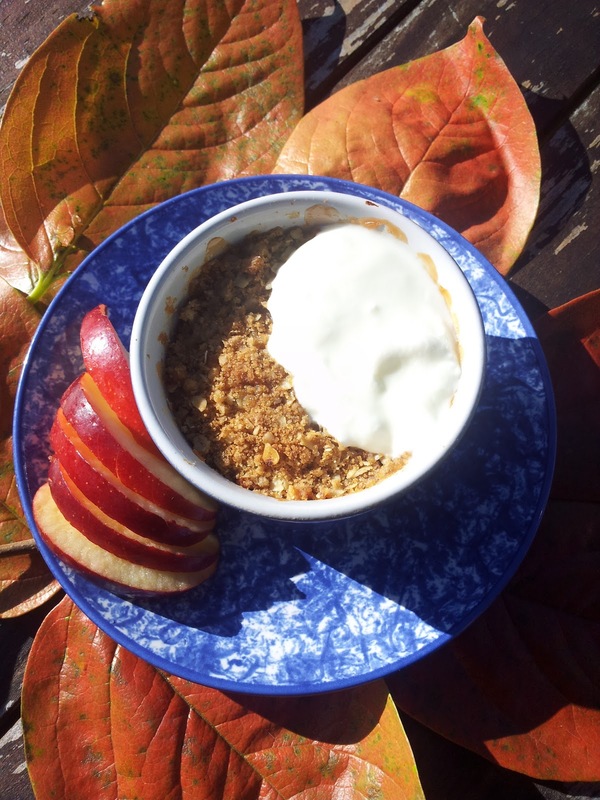 I've discovered a combination that the home taste panel really like....Apple, Feijoa and Banana Crumble - an idea from Julie Biuso. 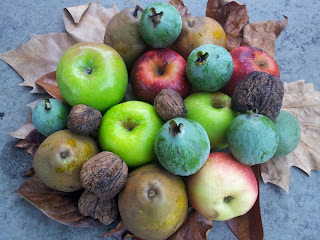 Autumn brings apples, pears, feijoas and walnuts to my pantry. A crumble is a perfect autumn pudding when apples, pears, and feijoas are in plentiful supply and the cooler weather creates an appetite for warming comfort food. liquid honey from The Naked Honey Pot Co based in Hawkes Bay. There are variations on the kind of crumble topping you can use to best show off your fruit. As this is a famous English pudding I decided to use a crumble recipe from a chef who is famous for promoting traditional British food, Hugh Fearnley-Whittingstall. His only alteration to the original is an option to replace one-third of the flour for ground almond meal. Hugh doesn't go for nuts or spices in his crumble as he feels they can upstage the pure flavour of the fruit. (alternatively use 120 g of flour and 4 Tbsp of ground almonds to make the crumble richer and benefit from the added nutrition of almonds). 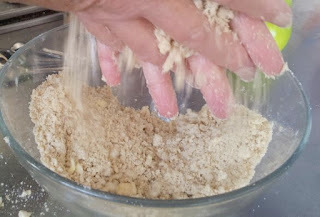 Rub/mix the butter and flour together, either by hand or food processor, until it looks like course breadcrumbs. Then add sugar and ground almonds. The food processor tends to make a finer more even crumb. You don't need to be so exact with measurements - ideally you fill your baking dish 2/3rd fruit, the other 1/4 to 1/3 being the topping. Add the juice of half a lemon and mix well through fruit to avoid fruit turning brown. Add 1 Tbsp of sugar (if using tart cookers you may want a little extra sugar). 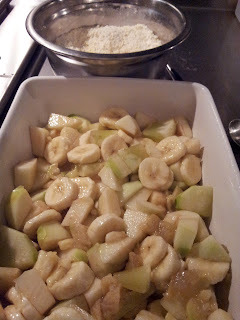 Remember bananas contain a lot of fruit sugar and it's good to have a contrast of slightly tart fruit with the sweet topping. Add fruit to a greased baking dish. The baking dish I used was 18 cm by 26 with a depth of 6 cm but you can use any shaped dish. an even and fine textured topping. I gently pat down the topping. Now spread over the crumble mix. 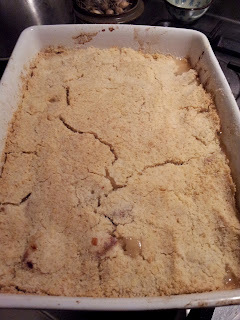 Hugh suggests using your fingers to scrunch together the crumble in places to form small peaks. I didn't do this but if you do then the peaks would be crunchy adding another layer of texture to the crumble. Cook for 30-40 minutes at 180. If the crumble starts to brown then cover with aluminium foil. 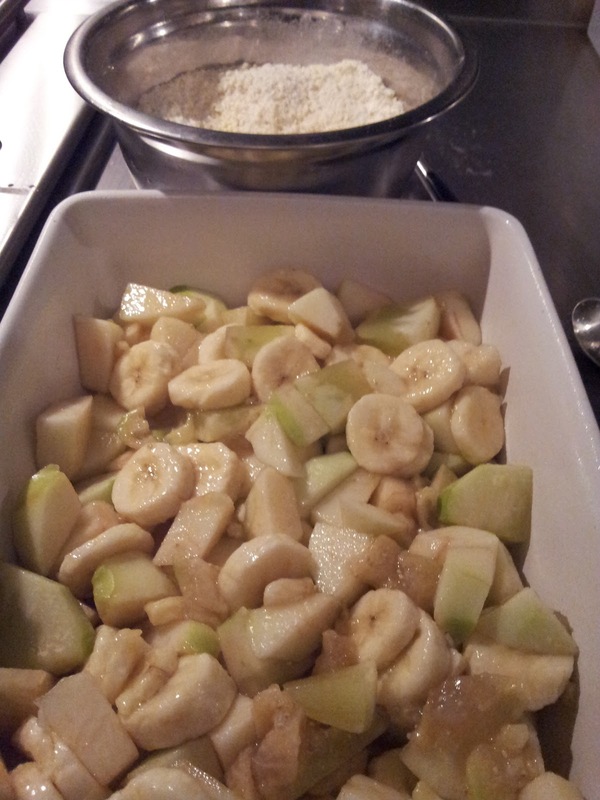 The fruit should be bubbling up around the edges of the crumble. 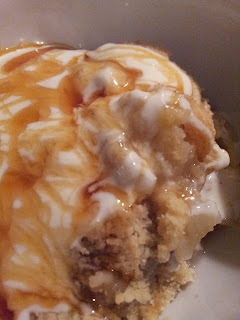 I refer to the crumble as humble because it is a simple dessert with few ingredients. It was also born out of hard times, created during World War II when rationing meant that pies were not an option. Today we have plenty of flour and butter but we are short on time, so the humble crumble is once again gaining popularity. A crumble takes only a few minutes to prepare for a no fuss bake in the oven. Since the 1940's the crumble recipe has been exported and adopted by cooks in many countries. I don't know if it is due to our fondness for ANZAC biscuits but in New Zealand we like to add rolled oats to the crumble crust. The presence of oats somehow makes it OK to eat the leftovers next morning for breakfast. You can use a food processor to prepare the crumble topping but if you have a few minutes to spare, want less washing up and a more rustic looking crumble, then try doing it the old fashioned way by "rubbing butter into flour". Rub the butter first into the flour and any added spices. Then add the sugar - makes the task less gritty that way. 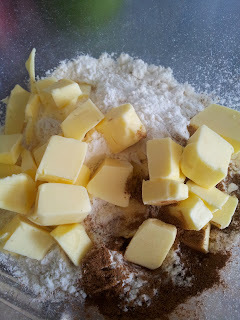 To "rub butter into flour" first cover the butter pieces with flour and gently push and spread the butter into the flour between your thumb and fingers. Then add sugar and rolled oats. 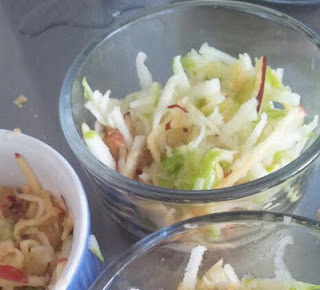 Now its time to prepare the fruit - 4 apples (depending on the size). Alison recommends grating the apple skin and all. This is a good idea if you haven't got a true cooking apple that will break down quickly and fluff up like a souffle when cooked. my version of Alison's Apple Crumble. 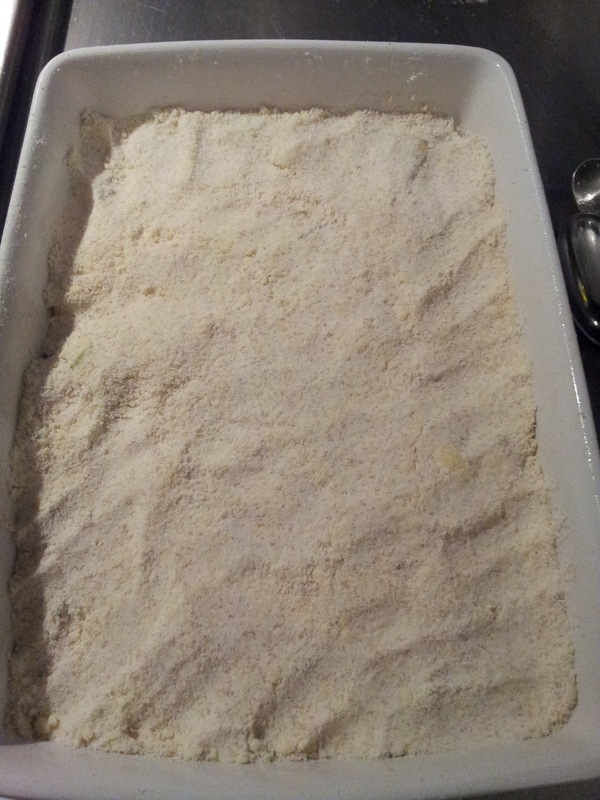 My Mum used to make a crumble that had fresh bread crumbs included with the flour. I couldn't find any reference to using breadcrumbs in crumbles in my search for recipes. I think this must have been a family recipe handed down from her Scottish grandmother. It would make sense to use the stale bread and not waste it. with an extraordinary name. They fluff up beautifully and taste great. I remember her crumble as being delicious. I am keen to recreate this humble crumble family recipe probably using Alison's recipe and replacing the oats with bread crumbs. 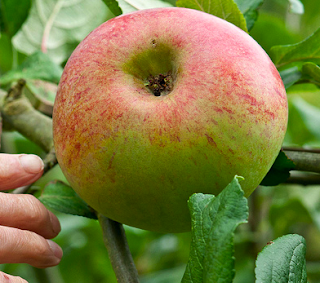 But to make a true recreation I need to source some real cooking apples up here in Auckland.